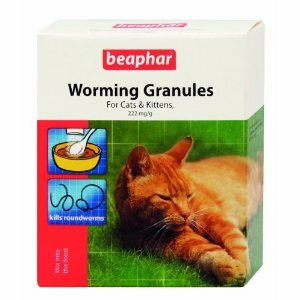 Beaphar Worming Granules are a simple, easy and no-nonsense solution to regular cat worming. Containing four sachets of odour-free, taste-free granules which are sprinkled onto the food. Each sachets typically treats a cat weighing 2.2kg for all common roundworm species found in the UK. Suitable for cats older than 6 months. 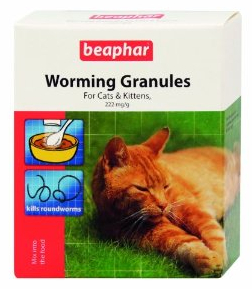 Below are some recent questions we've received regarding Beaphar Cat Worming Granules, including answers from our team. Does it need to be a specific weight for a cat? or can any size cat have this? Each sachets typically treats a cat weighing 2.2kg for all common roundworm species found in the UK.